For over half his life, 16-year-old Connor Pace battled the painful symptoms of Crohn's disease, a chronic condition involving inflammation of the digestive tract. Crohn's disease is becoming more prevalent in children and adolescents. Treatment includes taking antibiotics and corticosteroids to reduce inflammation; nutritional therapies, often involving tube feeding; and restorative surgery of a digestive tract ravaged by ulcers. Eventually Connor's condition progressed so far that his only option appeared to be a colostomy, a procedure to remove a large part of the colon. Fortunately, Dr. Haydar Frangoul found another solution to address Connor's chronic symptoms. Frangoul is a Pediatric Hematology/Oncology Specialist at The Children's Hospital at TriStar Centennial. He has conducted over 500 cutting edge pediatric stem cell transplant procedures; mostly to treat tumor and blood related cancers. Originally Frangoul planned to perform an autologous stem cell procedure, where Connor's stem cells would be harvested, frozen and stored, then re-implanted into Connor's bone marrow. That plan changed when Frangoul learned Connor had an identical twin brother, Cannon. The transplant team switched gears and pressed toward a syngeneic transplant, which uses stem cells from his identical twin brother. 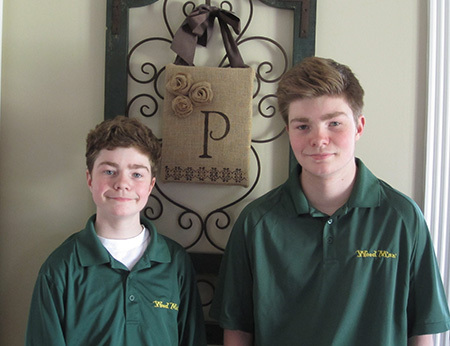 A transplant to treat Crohn's disease is a very new procedure and until Connor's case, had never been performed using an identical twin as a stem cell match. Cannon was indeed the perfect match Connor needed for his transplant. Some people wait years and search the globe before finding an appropriately matched donor. In Connor's case, a fully matched identical donor lived right under his roof. The benefit of using Cannon's stem cells was that Cannon's cells had never known Crohn's disease. When transplanted in Connor, the stem cells would regenerate without knowledge of Crohn's and inevitably result in remission of symptoms. Kristi Pace, Connon and Cannon's mother reflected, "We are so thankful and give God the glory for the timing of things. Dr. Frangoul was willing to give this procedure a shot, Cannon was a perfect match for Connor, and The Children's Hospital staff was ready to see the process through. We could not have asked for a better scenario. Dr. Frangoul took his time with us and was always available to calm our fears and answer questions. The transplant team honestly works as a well-oiled machine; focused on people, not just a procedure." The journey for Connor is not over. He faces weekly follow up exams, fist fulls of medications, and home schooling till his immune system is strong enough to evade environmental pathogens. Connor will be monitored every year for five years until clinicians can confirm a true remission of disease. Meanwhile at his home in Hendersonville, Tenn., Connor is enjoying all kinds of foods again and is driving his own truck. He also socializes with friends, fishes, and plays on the lake. If you ran across him on the street you'd think he was a completely healthy 16-year-old full of vigor and promise; the way it should be for Connor - the way it will be, thanks to the transplant procedure TriStar doctors were willing to complete. Teamwork saves expectant mom and premature baby in Hendersonville.